Tropical-Island dive centers / resorts at some of the best diving locations in Indonesia – stay and dive in Bunaken, Lembeh, Sanur/Bali, Amed, Nusa Lembongan, Gili Air and South Lombok with affordable accommodation away from the crowds. Relax and dive with us at one of our tropical island resorts, or visit two or more of our locations with a dive safari package that includes all your diving & accommodation. We frequently get customers visiting more than one of our locations in the same holiday as well as customers returning to us over a number of years to visit our different locations on different holidays. We also have some customers who return to their favourite locations again and again over many years. 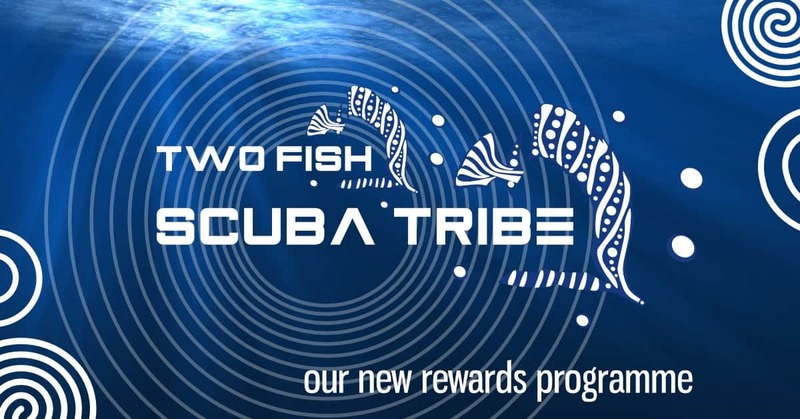 We reward you, our loyal customers, with our Scuba Tribe Rewards system whereby you can collect points by diving with us, doing a course with us and/or staying with us, and you can redeem these points for freebies like dives as well as gifts. Read more! Bunaken Island is just 45mins by boat from Manado and is right in the heart of the award-winning Bunaken Marine Park. The diving offers beautiful corals, lots of fish, amazing small critters, and some larger and exciting marine animals including reef sharks, huge turtles and schools of barracudas. We have our own resort on Bunaken Island. Its a beach-side resort with wooden cottages and 18m brand new swimming pool. Budget rooms are also available at the resort. Free Wi-Fi and full board. Lembeh Straits is 2 hours by car and boat from Manado. It is the muck diving capital of the world where you can hunt for amazing critters such as hairy frogfish, sea horses, flamboyant cuttlefish and mimic octopus. Muck dives are the main reason divers return to us time and time again. We have our own resort on Lembeh Island. It has wooden cottages with sea views, right in the heart of world famous Lembeh Straits. Budget rooms are also available. Free Wi-Fi and full board. Nusa Lembongan is just 30mins by boat from mainland Bali, and is where you can dive with the mantas and mola-mola that made Bali famous. You will also find large schools of fish, beautiful hard-corals, colourful soft corals and a range of critters from macro to pelagics. Something for everyone! We have our own resort with 10 villa-rooms surrounding the swimming pool, and only a two minute walk from the sandy beach. Nearby budget accommodation options are also available as well. Free Wi-Fi and breakfast. Amed is the perfect base to explore the diversity of Bali. It has top-class muck diving and easy drifts over reefs. It has wrecks – just 20 minutes car-ride from the famous USAT Liberty wreck, and the local Japanese Shipwreck in Amed. It also has sites where you will find more current and big fish – sharks, barracudas and occasionally even the ocean sunfish (Mola Mola). And day-trips can be organised to Candidasa, Padang Bai and Nusa Lembongan / Nusa Penida. We are based in our partner resort Surya Rainbow Villas, right on the beach in Amed. We can also recommend a selection of other accommodation in the area to suit a range of budgets. Enjoy the diversity of amazing Bali from our dive center in Sanur, Bali. We run day-trips on request from Sanur / Kuta / Seminyak / Legian to Tulamben, Amed, Nusa Penida/Nusa Lembongan and Padang Bai/Candidasa. Gili Air is placed on one of the most beautiful islands of the country, just 5 kilometers from Lombok. It is the second smallest of the Gili islands, as well as being the ideal starting point if you wish to scuba dive Gilis. Our dive center is located on Gili Air, a tropical-island dive resort right on the beach, away from the crowds of Gili Trawangan but close to its dive sites. We are based at the Villa Karang Hotel, right on the best beach front overlooking the mainland of Lombok. It has its own restaurant and all the other island facilities are within walking distance. The Senggigi region is the main tourist destination on the on the mainland of Lombok in Indonesia, and the main town of Senggigi offers a great base. 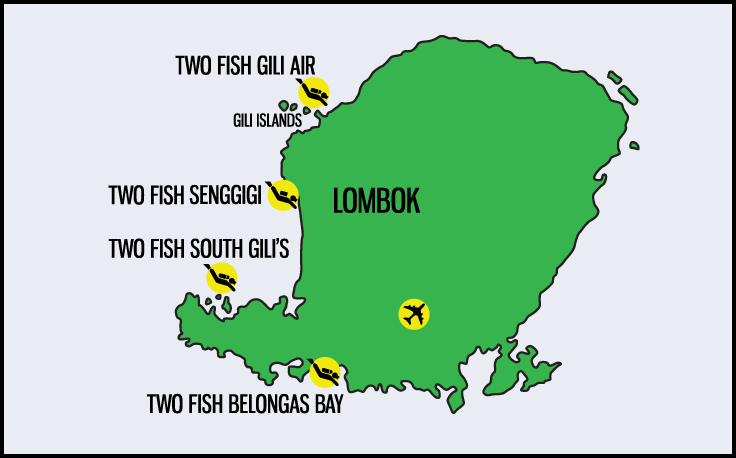 Our logistics office based in Senggigi can organise the quick and easy day-trips to the Gili Islands for you, as well as day-trips to South Gili’s and Belongas Bay. We can assist with booking plenty of accommodation possibilities in Senggigi. From budget to high end resorts, Senggigi offers a relaxed stay for all. We have secured deals with a number of these hotels for preferential rates and can offer packages that include diving and accommodation. The South Gili’s are a group of tropical islands in the south with white sand beaches, only a few dive resorts, and not much topside goings-on apart from snorkeling, swimming and scuba diving. Great diving on pristine and lively reefs, with abundant marine life. In Belongas Bay you’ll find an unspoiled underwater paradise with pristine reefs, an intact environment, challenging “adrenalin dives” with sighting of schooling barracudas, tunas, mobula and eagle rays and hammerheads. 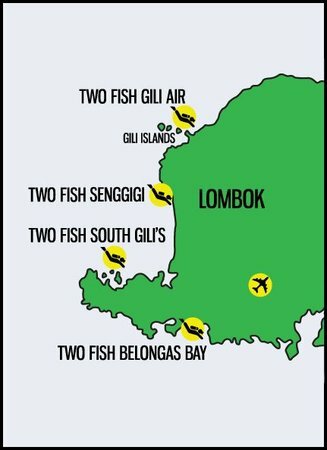 Our dive center is based in Sekotong, a small village on the mainland in South Lombok that is a short hop from all the dive sites of the South Gili’s. It’s also only a 1hour drive to Belongas which means that it is easy to arrange day-trips to suits your dates. The dive centre is located at our resort Villa Pao Pao and that is our first recommendation. As well as the resort Villa Pao Pao where our dive center is located, we also recommend other resorts all nearby with various levels of accommodation and budgets, and can assist with or recommend others. Please contact us for more details. Diving with Two Fish Divers means that you can book several stunning scuba diving locations with the same world-class operator in one holiday. 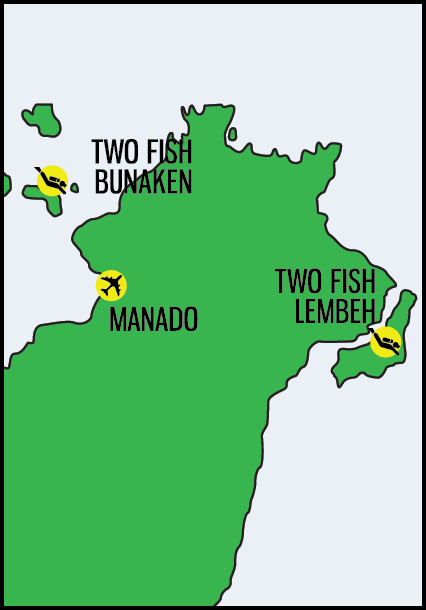 You can dive both Bunaken and Lembeh, they are only 3hours apart from each other. 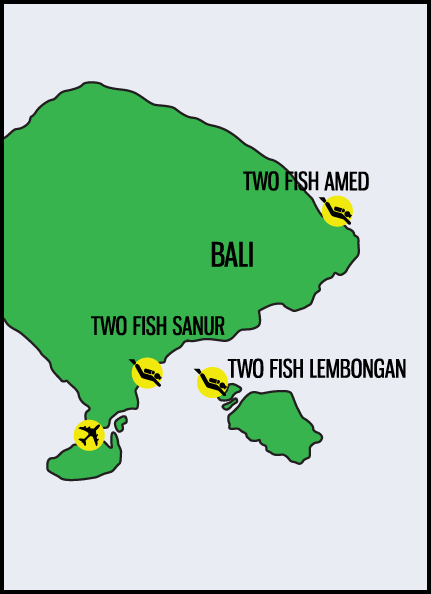 You can start or finish in Bali, its only a 3hour flight from either Bunaken and Lembeh. You can add on South Lombok, its only a 3hour ferry ride from Lembongan. Why not try all of our locations? 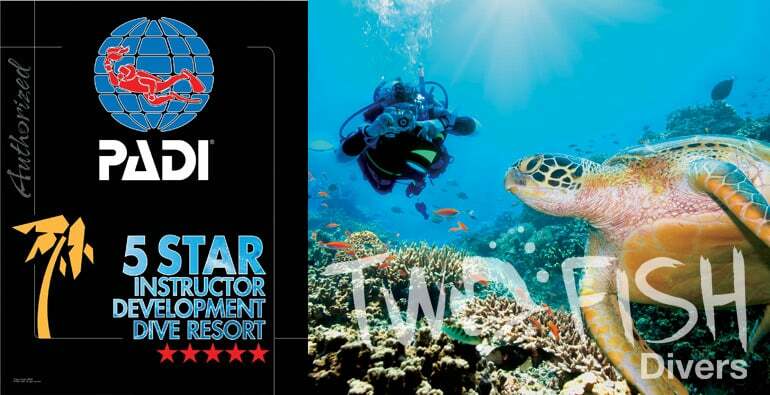 We are a PADI 5 Star Instructor Development Center, and we have a dedicated and experienced instructor team in each location that are committed to provide the best in tuition and experience. Discover diving, improve your skills or GOPro, we run these dive courses in all of our locations. Technical diving support, TDI and PADI diver level courses and TDI instructor training with our dedicated tech operation in Amed, Bali. Plus technical guiding in Bunaken, technical diving trips, CCR support and exploration.